This is the time of year when all restorationists are seeding red! 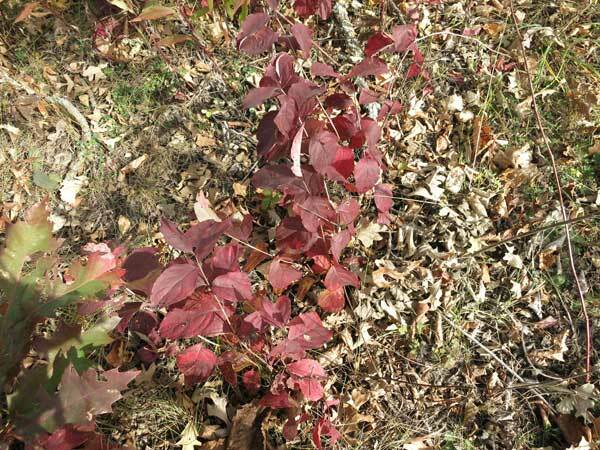 This is the best time to seek out invasive shrubs that can potentially cause trouble in a restoration project. Two shrubs that can cause major trouble are hazel (Corylus americana) and gray dogwood (Cornus racemosa). Although natives, they can be highly invasive, and can take over major parts of the restoration. 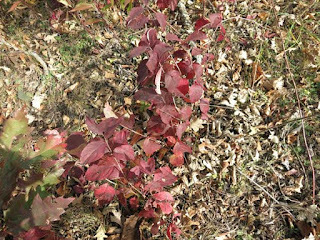 The leaves of both hazel and gray dogwood turn a rich red color in the fall, making them easy to find among prairies and savannas. 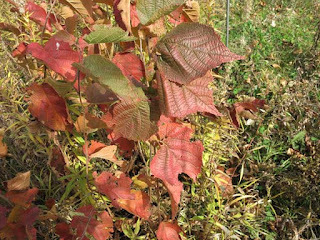 This hazel clone is easy to spot this time of year because of its lush red leaves. that has been burned annually for the past 15 years. Despite some reports, hazel is definitely a clone-former, and can spread extensively, especially in the absence of fire. It is a major threat in Minnesota where extensive research has been done to control it. Research at Minnesota's Cedar Creek Science Reserve has shown that annual or biennial fires are essential to control hazel. By the third year without fire, extensive hazel thickets usually have developed, through which fire will generally not carry. Fire will top-kill hazel but will not eradicate it. Gray dogwood (Cornus racemosa) is another clone former that can often form large thickets. It is a common shrub in prairie and savanna remnants. In the absence of fire, it can literally "take over" a remnant. It is a major problem in Illinois, but is also common in Wisconsin. These clonal shrubs are especially troublesome in remnant prairies and savannas where there is a legacy of woody vegetation. Such a legacy probably exists in almost all remnants found in southern Wisconsin because these remnants survived for many years without fire. It has only been since the mid 1980s that restoration work has begun in most remnants in our area, whereas fire had been mostly absent since the end of the 1930s. 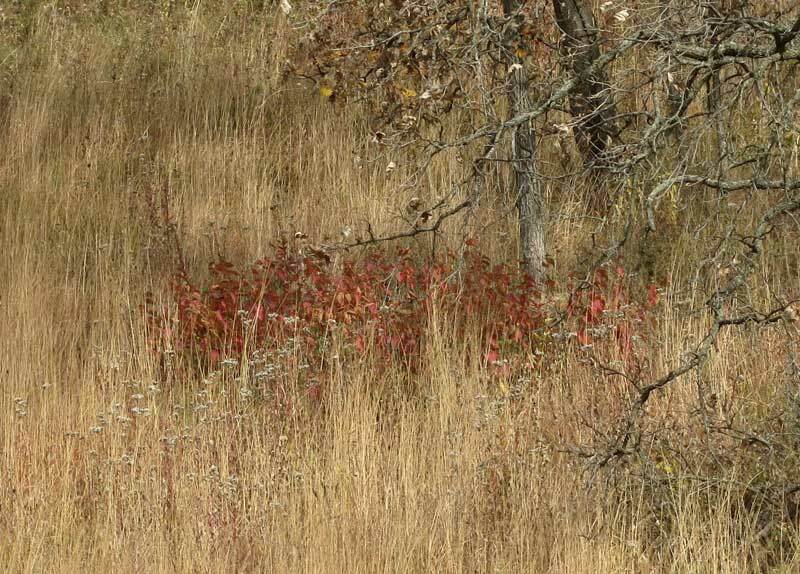 Although annual or biennial fire can problem control these shrubs indefinitely, the only way they can be eradicated is by the use of herbicides. I have posted extensively on herbicide techniques for woody shrubs. Note: There are situations where a woody legacy is not a problem. These are prairies that have been created from scratch from former agricultural fields. A field that has been in corn or soy beans for the last 10-50 or longer years no longer has a woody legacy. Thus, prairies created in such fields should not have any problems with woody encroachment. Burns at three-year intervals will likely be sufficient to maintain the prairie. However, even such prairies, in the prairie/forest border which is southern Wisconsin, will eventually become invaded with woody vegetation, as the example of Curtis Prairie on the UW-Madison Arboretum has shown.